If I'm completely honest with you.. I've never been into gloss.. not since I tried to look thrice my age by doing a full face of clown with that added extra gloss which I probably got free in shout magazine. Thems were the days. Anyway, I digress. If you follow me on youtube, or perhaps even on twitter then you'll know by now that I have an undying love for Charlotte Tilbury's Pillow Talk lip liner. I never knew I could love a lip liner so much.. especially in such a muted colour. Up until it's purchase I was pretty much a red lip every day gal. Oh how things change. After wearing it pretty much every day since it's arrival into my hands I began to feel that I wanted more... I didn't want to cover it with a lipstick but sometimes the matte look didn't quite feel 'spring enough'.. if you follow me? Anyway, as a Birthday treat, (as if I need an excuse) I popped over to my local CT counter in Selfridges and picked up three lip glosses. Three. I couldn't be happier with that fact though as the formula has completely won me over. Sure my hair gets stuck to my lips when I go out in the wind.. and okay.. it makes a spontaneous smooch rather messy but.. I'm okay with that! I'm pretty sure my boyfriend is fed up of being told 'No, you can't kiss me, I've just put my gloss on' but y'know.. sometimes needs must. Am I right? You can expect a little stickiness as it is a gloss after all.. but nothing like back in those shout days. They last really well, they're glossy without being insanely shiny and they just add that little 'somthin' somtehin' to an otherwise muted lip. My favourite is probably 'Blondie' as it adds a lovely shimmery tone to the lips... but I love the others almost just as much. If you want to see all of the other high-end products I splurged on and get a closer look at these badboy lip products then you can check out my haul video below! What's your opinion on lip gloss? Have I tempted you to get involved? 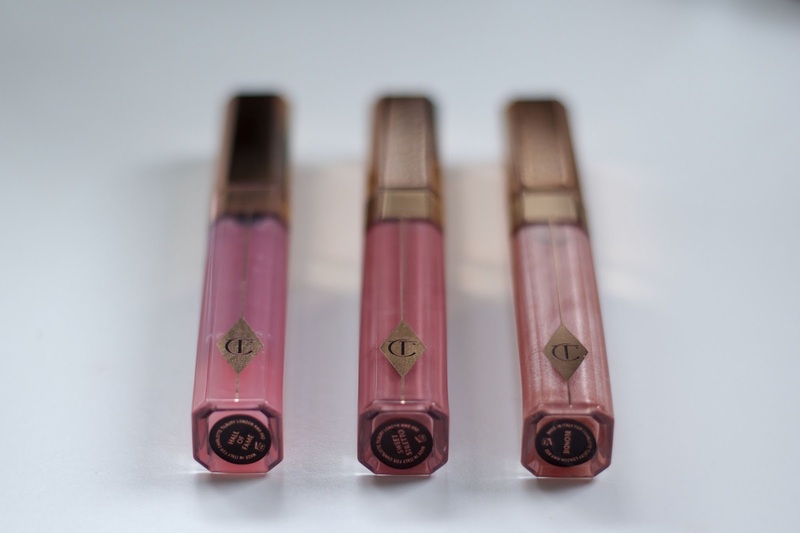 I'm not a lipgloss gal but I love the colours here - CT is on my wishlist for so many products! They're sooo good Lauren! Seriously suggest checking them out! I'm such a convert! !